Ta-Nehisi Coates (TNC) will give a talk here at SIUE on Wednesday, March 23, at 7:00 PM, in the Hickory Room at the Morris University Center. 1. A talented journalist. Coates has produced an impressive body of writings on politics, music, popular black cultural figures, and a variety of other topics. 2. A leading, wide-ranging blogger. Football. Politics. Dungeons and Dragons. Comedy. Rap. the Civil War. What it means to be a writer, a father, a son of a former Black Panther. Anger. Fears. Coates covers it all. Frequently. And on a highly visible platform--The Atlantic magazine site. 3. A significant public thinker. A blogger like Coates, with his up-to-date commentary and his active engagements with commenters, represents a notable shift from what we have typically seen from well-known writers and intellectuals. Indeed, Coates's blog is about the practice of black public thinking, not merely the notion of the black public intellectual. 4. A new, notable contributor to the tradition of African American literature. Coates's memoir The Beautiful Struggle is a useful addition to the body of interrelated texts that we refer to as African American literature. 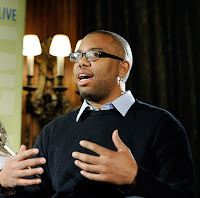 As mentioned, TNC had already published several journalistic pieces, but producing an autobiographical work that details the experiences and thoughts of a black boy growing up in America situates Coates's writings in a tradition of works that includes Frederick Douglass, Richard Wright, Malcolm X, and Barack Obama. 5. A Malcolmite. Some years ago, Coates wrote that he is "a Black Panther-sired, Malcolm X-worshiping, People's History of America-toting idealist." In addition to those things, something that really connects him to Malcolm is the nature of his street knowledge and consciousness regularly displayed in his writings. 6. Zora2.0. Like Zora Neale Hurston, Coates did some time at the Mecca, HU. More notably, Coates's background as a reporter leads him to interview all kinds of folks -- Bill Cosby, Michelle Obama, MF Doom, and most recently, residents in Palm Woods, a neighborhood on the outskirts of Detroit. His documentation and representation of the stories of black folks from all over is very Hurston-like. 7. A focal figure for black studies. In the fall of 2011, Black Studies @ SIUE is coordinating a reading project focusing on TNC's The Beautiful Struggle. Coates's talk provides us with an important preview. 8. An alternative to the typical speaker. When and if our university, like too many universities, brings black speakers to campus, those speakers are usually comedians and entertainers. TNC's writings are regularly infused with humor, and the experience of reading his work is enjoyable. But he's far from a comedian and entertainer. He's something else. 9. An aspiring rapper turned writer. In his memoir, Coates noted that when he was 12 years old and heard Lyrics of Fury, he "put away childish things, went to the notebook, and caged myself between the blue lines." First and foremost, respect to the God for influencing the young Coates and so many more. TNC's career confirms that lyricists don't necessarily have to become rappers. 10. The conscious folks. A cool thing about the presence of a "conscious" speaker is that they tend to attract conscious audiences. The Coates event should provide us with what has become too rare: getting all the conscious folks around here together at one time. 10 solid reasons, Howard. As you noted. the presentation will be on Wednesday, March 23rd, at 7:00 pm, in the Hickory/Hackberry Rooms in the Morris University Center (MUC). I would add that there will be refreshments available starting at 6:30 p.m., and there will be a book signing after TNC's talk, so bring your copies of The Beautiful Struggle with you!